Companion Animal(s): I currently have one dog, a Corgi named Ruby who I raised from a puppy. She lives with my parents since I don’t live at home. I also have a horse named CC, and when I was younger I learned how to ride her and I rode her for years. We basically grew up together because she has been with me all of my life, and she is the first companion animal I ever had. Joe, like fellow VegHead Trevor, is another vegan that I’ve been introduced to by Rachel but I’ve actually never met in person (but really want to!). This is one of my favorite VegHead profiles because of the photos of Joe’s animal friends from his time volunteering at an animal sanctuary in France. Who can resist those goats and cows? Keep reading to meet Rhea and Zephyr, the films that influenced Joe’s shift to veganism, and why California rocks Joe’s socks. This Wednesday was an exciting day for me: After almost four years of being vegan, I made my own plant-based milk! Writing my post on everything to know about vegan milks made me want to get some hands-on experience. I decided to try oatmilk, since oats are much cheaper than nuts. All I needed was water, oats, a blender, and something to strain with. I let myself splurge a bit and purchased a pair of beautiful, reusable nut milk bags made of organic cotton from a responsible company for straining, since I knew there would be lots of other recipes I would use them for. Once I had made the oatmilk, I also added canola oil, salt, and vanilla. Here’s a step-by-step photo guide to my experience. Kat is one of my favorite Instagrammers and vegans. Her vegan food posts, whether its homemade or from a restaurant, make me risk getting hungry every time I open Instagram. She also makes me want to run out and buy all the bath bombs, cute clothes, and makeup I can. Kat and I went to the same high school in Germany, and the only contact we’ve had since is through social media, but our veganism brings us together! This VegHead Profile was one of my favorites to write since she gives such awesome recommendations. My advice? Check out her YouTube channel here! Hometown: I’m a military kid, so I don’t have one! Swapping out cow’s milk for lactose-free vegan milk made from plants is probably the easiest change you can make for animals and the planet. Vegan author Carol J. Adams even features this switch as Daily Action #1 in her book Protest Kitchen. These milks are made from a wide range of beans, nuts, seeds, and grains. Boxes, bottles, cartons, and cans of plant-based milk can be found in grocery stores across the world, and new flavors and brands are showing up on the shelves all the time. I regularly stock my fridge with vanilla, chocolate, unsweetened, and plain flavors depending on what taste I’m craving and what I plan on cooking or baking. You can even make your own plant milks at home by soaking unsalted nuts like almonds and cashews, seeds, or grains in water overnight, blending them, and straining the mixture through a cheesecloth. But maybe you don’t know what plant-based milk to try, or if plant-based milks can stack up to the nutrition in cow’s milk. What vegan milk should you use for what in the kitchen? What are the environmental impacts of different plant-based milks? Is soy bad for you? Read on to answer these and other questions! Rachael Moore graduated from Dickinson College in the summer of 2018, and for the year before that she was our house “mom” at the Treehouse, or Center for Sustainable Living, at Dickinson. I had a chance to visit her last July at the Rodale Institute in Kutztown, Pennsylvania, during their field day, and see her passion for agriculture in action. I think of her as a huge proponent for self-care and wellness, as well as a master of aesthetic sustainability. 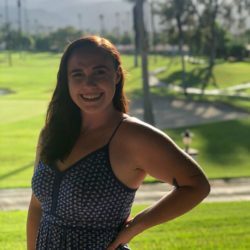 Read on to learn how being diagnosed with Type 1 Diabetes changed Rachael’s relationship with food and our food system, what’s on her travel bucketlist, and the experience that turned her towards vegetarianism. Occupation: I work as a Research Technician. I’m assisting a group of researchers in studying organic and conventional agriculture, and I think I’m pretty lucky to wake up and do it every day! Companion Animal(s): I have a cat named Ginger. She was 4 months old and living as a barn kitten when I adopted her. Living alone can be lonely and she has been an exciting addition to my apartment. Nesri and I went to the same high school in Germany together, and she was vegan before I even knew I was going to be! She’s originally from Ethiopia and is active in her school’s Muslim Student Association. In this VegHead Profile, Nesri tells us why we need to visit Ethiopia and read her favorite books on social justice, and gives us a glimpse into her travels through her photos. New to making Do-It-Yourself (DIY) body care products? Here’s a great one to start with. I just finished my first week of my last semester in college, and I had A LOT going on.